"As always in the past, the Proceedings will be what the Academy membership makes of it. It is up to the members to create the journal they want, by the simple expedient of submitting the type of material they believe to be important, needed, and appropriate for its pages." - Paul Meglitch, 1971. The "new" Proceedings. Proc. Iowa Acad. Sci, 78:1. The Iowa Academy of Science encourages the publishing of high quality peer reviewed scholarship, referenced articles of scientific interest, reflective pieces and other informative articles of concern to science and science education. 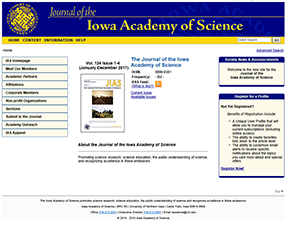 IAS Members receive the Journal of the Iowa Academy of Science with their membership.